PPP’s new Texas poll finds that Wendy Davis made a good impression on voters in the state last week- but that Rick Perry has also enhanced his political standing considerably over the last five months, making him tough to beat for reelection. 39% of Texans have a favorable opinion of Davis to 29% with a negative one after her week in the spotlight. Her net favorability is up 14 points from -4 at 15/19 in January. By a 45/40 margin voters say they support her filibuster last week, and by a narrow 44/43 margin they don’t think Perry should call another special session. Voters oppose Senate Bill 5 by an 8 point margin, 28/20, although the 52% with no opinion is a reality check on how closely most people follow state politics. Nevertheless Davis would trail Rick Perry by 14 points in a hypothetical match up, 53/39. While Davis’ standing has improved over the last five months so has Perry’s. Although he remains unpopular, with 45% of voters approving of him to 50% who disapprove, his approval is up a net 8 points from January when he was at a -13 spread (41/54). In addition to his lead over Davis, Perry also leads Julian Castro 50/43, Bill White 50/40, and Annise Parker 52/35. In January he led this quartet of Democrats by an average of 4 points, now he leads them by an average of 12. The main reason for Perry’s improved numbers is enhanced standing with the Republican base, and that’s playing out in his primary election numbers too. In January Perry’s approval with GOP voters was 68/26, but that’s up to 81/16 now. Perry now leads Greg Abbott 46/34 in a hypothetical primary election, up from 41/38 in January. Texans have still had enough of Perry- only 30% want him to seek another term, compared to 60% who think he should step aside. But for now at least it looks like he’s strong enough to slip through a primary, and if he’s able to do that Texas’ Republican lean would likely get him elected to his 4th term. Abbott still does better than Perry in match ups against all of the Democrats except for Davis. He only leads her 48/40, compared to Perry’s 14 point lead. But against Castro (48/34), White (48/36), and Parker (50/31) Abbott’s leads exceed Perry’s. See here for the full poll data. You can fudge things around a bit if you want, but there’s not much of a toehold there. Really, I think PPP buried the lede on this, since its numbers show San Antonio Mayor Julian Castro within seven points of Perry. Of course, we know Castro isn’t running, so that’s strictly fantasy football stuff. As I suggested before, Davis’ higher profile might actually work against her a bit, in that the forceful reminder of her Democratic bona fides might dampen some of her previously demonstrated crossover appeal. I feel confident that there remain plenty of Republican voters who would abandon Rick Perry for a reasonable alternative. Whether this poll is just reflecting some in-the-moment tribalism, or it’s evidence that Davis isn’t the alternative they’re seeking I can’t say – perhaps the next poll will give a hint. But let’s be clear that while Davis likely is the best candidate Dems can get for 2014, she’d have a steep hill to climb. It’s doable under reasonably optimistic assumptions, but it sure wouldn’t be easy. So let’s all take a deep breath and remind ourselves that this is still a long journey. As Wayne Slater writes, even without any short-term game, the Davis ascendancy can and should pay dividends to the Dems. If all this has the effect of getting more people involved in Battleground Texas and other organizations working for the progressive cause, it’s all to the good. If we have to wait beyond 2014 to see it all bear fruit, then so be it. 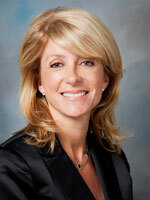 In the meantime, we can go back to serious business like Wendy Davis’ hair color. Because that’s what the people really want to know about.